Soft tissue sarcoma is a type of cancer that begins in the soft tissues of your body. Soft tissues connect, support and surround other body structures. The soft tissues include muscle, fat, blood vessels, nerves, tendons and the lining of your joints. Soft Tissue Sarcoma is a very rare cancer but has been extensively studied. Approximately eleven thousand cases of Soft Tissue Sarcoma are documented in the United States per year. 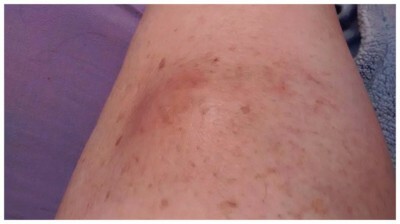 Many types of soft tissue sarcoma exist. Some types are more likely to affect children, while others affect mostly adults. Soft tissue sarcoma can occur anywhere in your body, but the most common types occur in the abdomen and in the arms and legs. 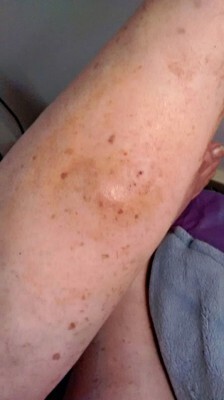 My particular Sarcoma manifested itself in my left leg. Sometime in January or February of this year, my left leg started aching me as if I had arthritis. It kept bothering me at night and began to hurt when I walked on it. 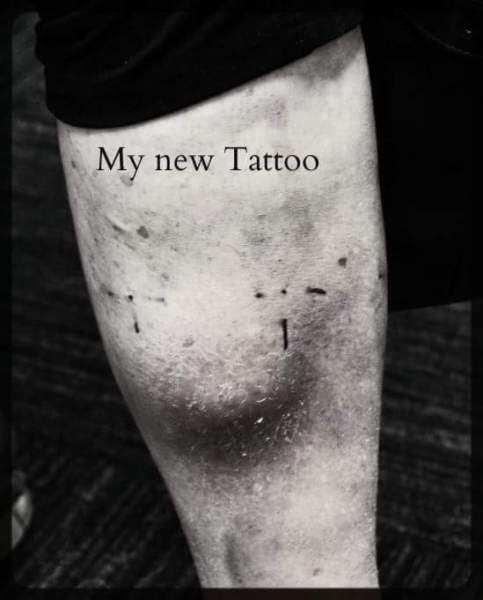 Sometime around March or April of this year a small bump appeared on my leg and I just ignored it because I thought it was some kind of nodule or benign cyst. Around May or June, the bump was getting bigger and turning red. 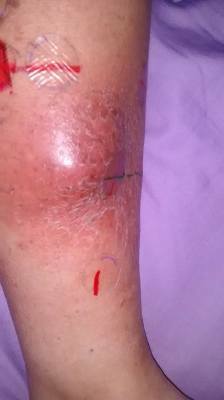 On June 17, I went to my PCP and she thought it was a spider bite that got infected and gave me antibiotics. I took the antibiotics and they ran their course and it did not affect the bump or the size of it . She ordered an ultrasound which detected a 4cm mass in my lower left leg. From there I was referred to a surgeon, ( Dr. Locke), in PLacerville. Dr. Locke suspected it was Cancer due to the size and color, so he ordered another ultrasound, an MRI, and a biopsy. OnAugust 3, 2016, I was diagnosed with Soft Tissue Sarcoma, (High Grade), which means it is a very aggressive cancer. On August 15, 2016 I had a PET SCAN of my entire body to see if the Sarcoma had spread to other parts of my body. The tests reflected the rest of my body is cancer free at this point. So the doctors are confident they can shrink the tumor and remove it surgically before it spreads. It is my understanding the surgery is very complex and difficult because I have major veins and arteries running through the tumor that are feeding it.. The doctor who will be performing the surgery is Dr. Robert Canter . He is one of the very best Oncologist Surgeons in the Nation and specializes in Soft Tissue Sarcoma. People come from all over the world to have him treat their Sarcoma's. I'm very blessed to have him! He is HIGH ENERGY and very confident in his craft. It is my understanding through the consultations and examinations that have been performed so far, this type of cancer was handled in the past with amputation of the leg . The new technology have given physicians options to save the limb with the same survival rate as the patients that had their limbs amputated. So....................I know I'm a lucky girl!! This week they have been doing the preliminary work for the radiation therapy I am about to begin. Consultations of what to expect and Lab work to make sure I can with stand the radiation therapy. Next week I will start the PREP for the radiation. They will do a CATSCAN with IV contrast to detect the size and density of the tumor up to this point. Then they will do what you call a SIMULATION, where they will position my body in the same position they want it to stay for the duration of the radiation therapy. The tumor has to be hit everyday at the precise location on the tumor to make sure it kills the cancer cells with minimal damage to the healthy cells surrounding the tumor. Then my care team will develop the exact dose of radiation they deem will destroy cancer cells and the radiation treatment will begin. 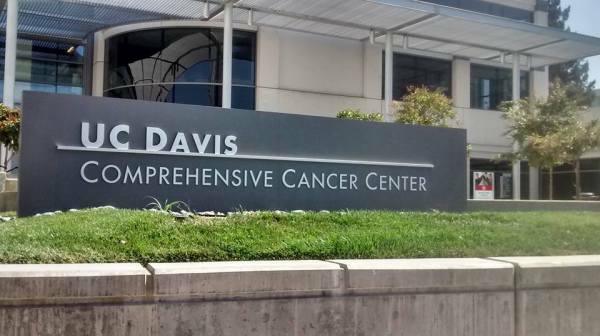 The UC DAVIS COMPREHENSIVE CANCER CENTER IS NOW MY NEW HOME AWAY FROM HOME THROUGH-OUT THE DURATION OF THIS TREAMENT. I have found the enviroment to be "WARM AND GENUINE" From my first visit I was put at ease with the kindness, caring and compassionate people who work here. My entire care-team is "off the hook amazing". My oldest granddaughter, Jessica Piexoto, (who is my best friend and my ROCK, pictured here with me on our first visit). Jessica has accompanied me to every appointment as my second set of ears; she has listened to my complaints, fears, anxieties, with her calming, caring manner that is so endearing to me. She is also my own personal photographer and GO TO person when things are falling apart. I love her to the moon and back and I am so ............thankful I have her in my life and she is related to me!! Like everyone else, when I was first diagnosed I was terrified and had absolutley NO CLUE what the word SARCOMA meant, nor did I associate it with Cancer. I always thought Cancer meant CARCINOMA and didn't realize there were a GAZILLION differnt terms for Cancer and the individual paths they take in your body. Once I found out it was a RARE CANCER, and AGRESSIVE, I was even more anxious about how I was going to approach this and GET IT OUT OF MY BODY!!.. However, from the minute I had my first appointment at UC DAVIS, I realized the people that work here are highly trained professionals, who take their jobs very seriously and take a personal interest in the people they are treating. Their confidence in their function and knowledge of the specific cancer's they are treating made me realize THIS IS CANCER AND NOT A DEATH SENTENCE. Many cancers are very treatable, and I am fortunate enough to have caught mine before it spread to other parts of my body. Even so, there is hope for people who feel hopeless. Simulation and or body mapping. First step to radiation therapy. 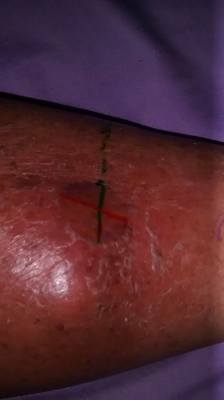 Marking the tumor on my leg as a guide for radiation. Conforming my leg into position to accept the radiation beams. This position has to be held for the duration of the radiation treatment. This is a critical part of the plan. This nice young man, Brett, (I hope I spelled his name right) is a part of my amazing care team and was a good sport in having his picture taken. Jennifer Kellogg is The Chief Aministration Officer for the Radiology, Oncology Department and she is difinitely ON TOP OF HER GAME!! She is a very kind, sweet, fun loving individual with this bubbly personality She went the extra mile and then some in order to make it possible for me to do this documentary on my Cancer journey. She did not miss a beat in alerting the faculty and staff that my granddaughter and I would be coming their way with a camera. She is a warm , caring person with an infectious smile and personality. It is obvious she is the one that can make things happen in that department and quite obvious her leadership sets the tone for the KIND AND CARING individuals who handle anxious and sick Cancer patients. 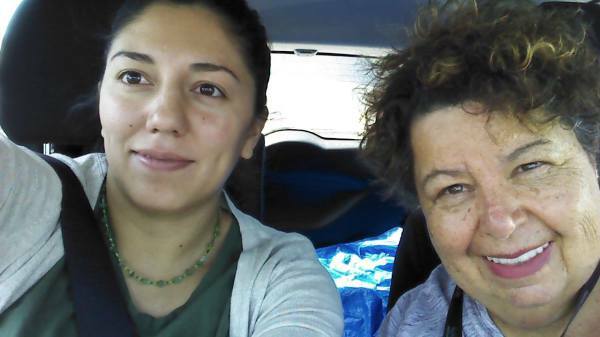 My dear friend Barbara Clark drove me to my first day of radiation. My granddaughter Jess, (who is my regular support person ), had her own doctor's appointment that day. Barbara and I go way.................back.. Like 41 years! We were both pregnant with our youngest children at the same time. We had fun reminiscing on old times and looking back at how fast the years have flown. I was scheduled to start radiation on Tuesday, October 4, however, my doctor was leaving town for two weeks and wanted to check me and my scans before he left, so that changed my first day to Monday, October 3, 2016. 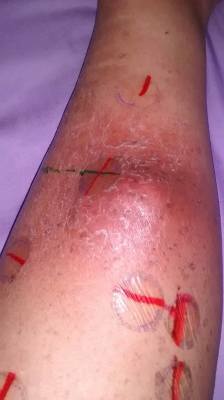 On the right you will see more markings on my leg and the tumor for the guidlines for the radiation beams. This little character is Dominique Laqui; she is the front desk receptionist for the Radiation Department. She is the first person I see everyday when coming into radiation. She always wears that great big smile on her face and she is extremely helpful and kind. She even offered to beat up the parking lot attendant if he didn't accept my validated parking ticket! Tee hee. My beautiful radiation therapists/ Top left is Debra Du and on my right is Huynh Ha. These girls are the BEST OF THE BEST!! They are precise and articulate and professionals in every since of the word. 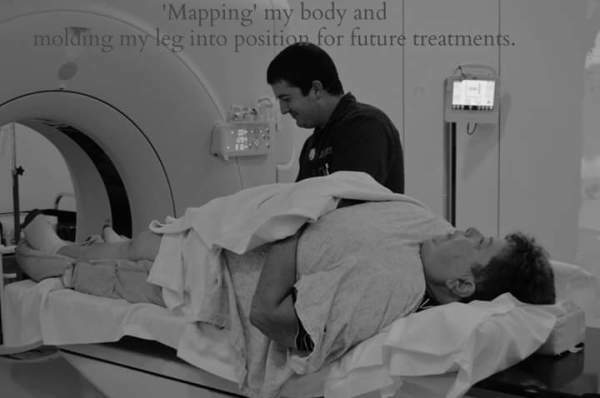 In the top left picture they are aligning my leg in the position it needs to stay for the duration of the radiation. This is a daily ritual. They spend most of their time lining me up. The actual radiation only lasts for a few minutes. I always feel SAFE with these girls!!. They know what they are doing and always make this experience much better than it appears to be!! So.............blessed they are on my CARE TEAM!! FROM THE CONTROL ROOM THEY CAN WATCH ME AT ALL TIMES WHEN I'M IN THE MACHINE. THEY CAN TALK WITH ME/ AND GIVE ME DIRECTIONS IF NECESSARY OR JUST LET ME KNOW THEY ARE THERE. It is my understanding after my third week status check with Dr. Monjazeb, the tumor would shrink very little if anything at all. (Which was way.............off base from my original understanding of the purpose of radiation). 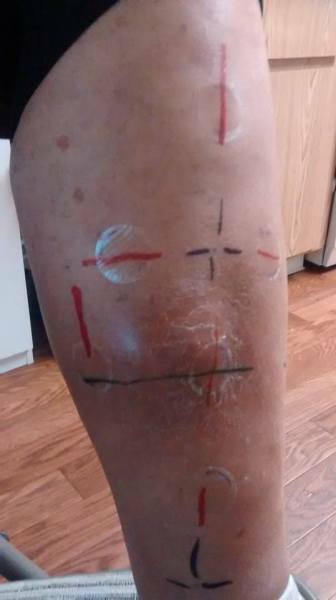 He said it would kill the cancer cells and leave a mark for the surgeons in order to get all the tissue out when I have surgery. It is now m​y understanding the radiation "deadens the tissue from the inside out"... hmm... very interesting. The first week of radiation was a "piece of cake", didn't feel any different; the second week knocked me for a loop!! I had tremdeous back pain and nerve paid and I was extremely tired. The third week I felt great. Still pretty tired on a regular basis. Not alot of energy to do anything extra. The inconvenience of coming down to Sacramento to UCD is the only drawback. It throws you off schedule and then throws your eating habits off base and I have been desperatley trying to stick to a plant based diet. I can feel the affects of the traveling and my sleeping pattern, but all-n-all I feel pretty well. ​​1965- BROKE THIS LEFT ANKLE PLAYING SOCCER IN MY 8TH GRADE GYM CLASS. 1986- BROKE THIS LEFT ANKLE AGAIN DELIVERING NEWSPAPERS WITH MY 10 YEAR OLD SON, TYLER. SLIPPED ON A ROCK COMING DOWN A HILL. FEB 1, 2011 BROKE THIS LEFT ANKLE AGAIN AND THE METATARSOL BONE IN MY FOOT COMING OFF MY FRONT PORCH. MISSED MY STEP AND ENDED UP IN THE FLOWER BEDS. HIS WIFE CE CE, NANI, SUSAN AND VIVEK. 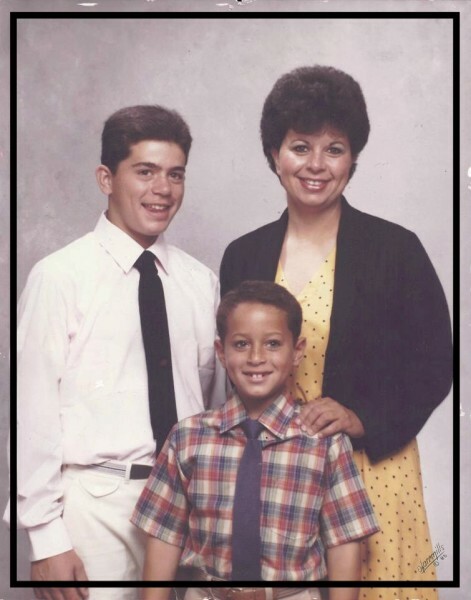 MY OLDEST SON JASON, TYLER AND I IN 1985. TYLER AND SUSAN AROUND 2009. ​ SUSAN IS THE ONE WHO WAS WITH HIM THE DAY HE WAS KILLED. BESIDES THE SHOCK OF TYLER'S DEATH, I WAS THROWN INTO INTENSE ANXIETY AND DEPRESSION FOR MONTHS AND MONTHS; ESPECIALLY FOR THE DURATION OF THE COURT HEARINGS REGARDING THE YOUNG MAN THAT KILLED TYLER. TYLER WAS KILLED AT 2'O CLOCK IN THE AFTERNOON IN FRONT OF HIS NINE YEAR OLD DAUGHTER, SUSAN. 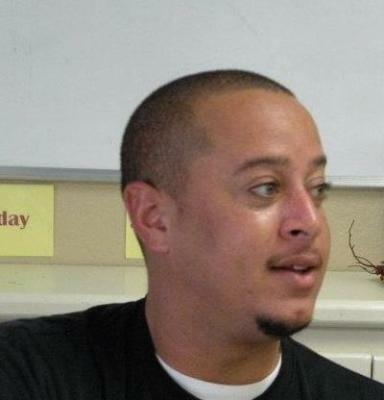 HE WAS SHOT FIVE TIMES AFTER OFFERING TO GIVE THIS YOUNG MAN A RIDE BACK TO STOCKTON AS A FAVOR TO A FRIEND. TYLER WAS 35 YEARS OLD AT THE TIME OF HIS DEATH. THE COURT HEARINGS AND MEETINGS WITH THE DISTRICT ATTORNEY LASTED 18 MONTHS ALL TOGETHER. IT WAS A BRUTAL PROCESS WITH EMOTIONAL UPS AND DOWNS I HAD NOT ANTICIPATED. I LOST 45 LBS IMMEDIATLEY AFTER TYLER DIED FROM THE GRIEF ITSELF, AND BECAUSE OF THE INTENSE STRESS, EIGHT OF MY TEETH LITERALLY FELL OUT OF MY MOUTH. MY MOTHER HAD MERCY ON ME AND PAID FOR ME TO HAVE IMPLANTS BECAUSE I LOST SO MANY TEETH. IT WASN'T UNTIL THAT HAPPENED THAT I REALIZED WHAT STRESS DOES TO YOUR BODY. I CONTINUED TO HAVE MANY ANXIETY ATTACKS AND TRIED TO CONTROL THEM, BUT NOTHING WORKED. I ENDED UP DRIVING MYSELF TO THE EMERGENCY ROOM SEVERAL TIMES IN ORDER TO HAVE BREATHING TREATMENTS ETC. BECAUSE I COULD NOT CONTROL MY STRESS LEVEL. ON TWO OCCASIONS THE EMERGENCY ROOM DOCTOR SAID MY CORTISOL LEVELS WERE EXTREMELY HIGH AND ADVISED ME TO GO GET COUNSELING. I HAD NO CLUE WHAT CORTISOL MEANT TO THE WELL BEING OF MY BODY. I CONTINUED TO GRIEVE IMMENSLEY OVER TYLER UNTIL I DEVELOPED AN ULCER; THEN MY MOTHER SUDDENLY DIED OF LYMPHOMA THREE MONTHS AFTER SHE WAS DIAGNOSED. ONCE AGAIN, I WAS DEVASTATED AS SHE DIED THE SAME WEEK TYLER DID ONLY THREE YEARS LATER. THE GRIEF I EXPERIENCED OVER MY MOTHER WAS INTENSE AS SHE WAS MY BEST FRIEND AND MY ROCK. HER SUDDEN DEATH STUNNED ME AS SHE WAS THE ONE WHO GOT ME THROUGH TYLER'S DEATH. FROM THERE ON OUT MY HEALTH DECLINED; I LOST ALL OF MY ENERGY AND FELT IT WAS ALMOST IMPOSSIBLE TO GET UP IN THE MORNING. I WAS UNAWARE THAT I WAS CHRONICALLY DEPRESSED AND CONTINUED TO WORK, BUT BECAME LESS AND LESS ENERGIZED AS THE DAYS AND WEEKS PASSED. IN 2015 I STARTED GOING TO THE DOCTOR'S TO TRY AND FIND OUT WHAT WAS GOING ON WITH ME. I WENT THROUGH SEVERAL TEST'S AND SCREENINGS ONLY TO FIND MY THYROID WAS PRETTY MUCH SHOT AND I HAD DEVELOPED THE ULCER. THE REST IS PRETTY MUCH HISTORY/ DESCRIBED IN MY PATH TO DIAGNOSES ABOVE. 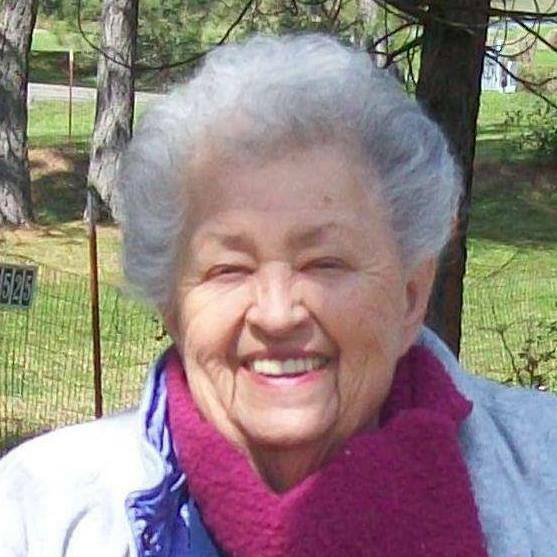 MY BEAUTIFUL MOTHER IN 2013, ( A YEAR BEFORE SHE PASSED AWAY).. I STILL MISS HER LIKE CRAZY AND CONTINUE TO TALK TO HER ON A DAILY BASIS JUST TO HEAR THE ADVICE I KNOW SHE WOULD GIVE ME!! REST IN PEACE MOM, TILL WE MEET AGAIN!! FOURTH WEEK OF RADIATION COMPLETED!! PICTURED HERE IS DREW, ( WHO CAME IN ON THE THIRD WEEK AND WORKED THROUGHOUT THE FOURTH WEEK ASSISTING MY TWO FAVORITE GIRLS)..
LEFT HAND CORNER IS HUYNH, DREW, AND DEBRA. 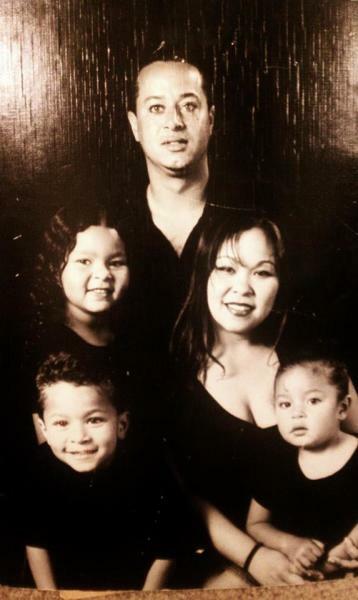 RIGHT HAND CORNER IS DREW, MYSELF, DEBRA AND HUYNH. BOTTOM LEFT IS DREW ROCKIN THE TOMO MACHINE AS IF HE OWNS IT!! 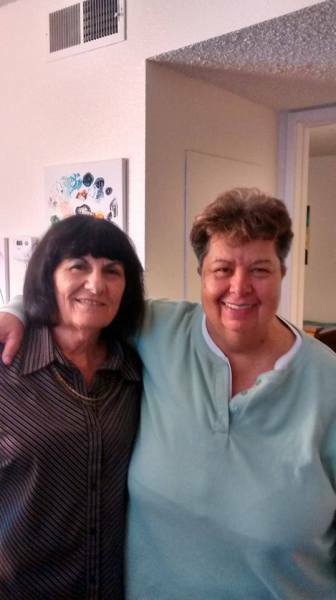 "My journey in Radiation Oncology began 12 years ago when I was working as an Xray tech at Kaiser. Our director announced the addition of Radiation Oncology to our group. Kaiser at the time did not ave any Radiation Oncology centers in California so this was exciting news. I immediately researched this new department and knew this is the field for me. I like talking to my patients and following up. In Radiology, you never know if that patient made it to their birthday dinner, got accepted into the college of choice or even went on the cruise they talked about during the 5 minutes of interaction you have with those patients. Here in Radiation Oncoloogy, you get those answers and MANY more. You form a lifetime bond with these patients and see their progress. You cry tears of joy when they come back for a follow up visit and know they will be ok. This field is rewarding in every single way. I love my job and my patients. I cherish the special moments and conversations I have with them. I will continue to give the care I would like to receive in return". "I came across radiation oncology and fell in love with it completely by chance. Nobody in my family works in healthcare, and I did not even know radiation treatment for cancer exists until I volunteered at a Cancer Hospital in Saigon when I was 14, distributing food for cancer patients and their families who left with no money after having to use up all their resources for medications and cost of treatment. My aunt and my uncle also passed away from having cancer. From these first hand experiences I realize cancer is scary and fighting cancer is a very difficult journey. But I want to join the fight. I want to be a radiation therapist. There is no training programs available in Vietnam for radiation therapy. That's why when I came to the United State in 2008 I was determined to get accepted to the Radiation Therapy program at Yale Hospital. Determination and hard work paid off. I am now working everyday as an radiation therapist at UC Davis and everyday I feel so blessed to be able to help patients through this difficult journey. It brings me great joy working with patients. Like when a patient told me that I gave him a smile he really needed coming in for treatment, going through what he had to go through. Or when patients come back to visit after finishing their treatments and I see them being healthy and back to their normal life, it is the best feeling in the world." The first thing I recognize about Jo was her amazing glow and positive spirit. 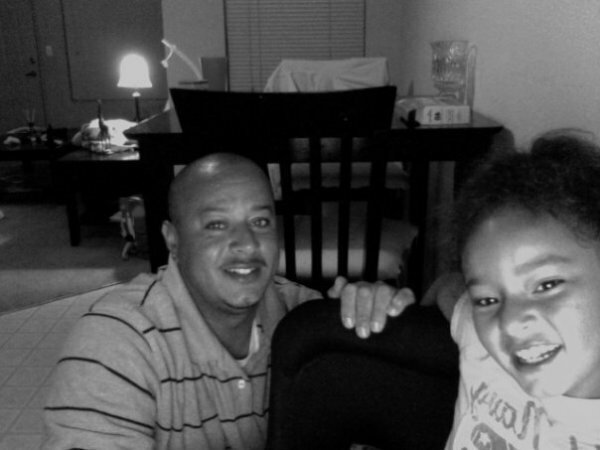 She had this great Positive energy flowing from her , even though she seemed so young to me to be fighting cancer. As we shared our stories, I came to realize what an amazing BRAVE GIRL SHE IS!!. By the time Jo had arrived in radiation she had already been through a year of HELL!! She was diagnosed with third stage bladder cancer last November 13, and she had already gone through four months of Chemotherapy, major surgery where they took her bladder out and attached a Stoma to accomodate that funtion and then here she was in radiation to try and stave off any remains of cancer that might go to other parts of her body. After listening to her story, I felt like such a SISSY!! She is one of the BRAVEST PEOPLE I KNOW ! I AM SO HAPPY HEAVENLY FATHER ALLOWED ME TO RUB SHOULDERS WITH SUCH AN AMAZING SPIRIT IN THIS LIFE AND I KNOW WE WILL FOREVER HAVE A PERMANENT BOND JUST BECAUSE WE BOTH UNDERSTOOD WHAT WE WERE FACING. PRAY FOR THIS AMAZING GIRL THAT SHE WILL COME OFF THE CONQUERER AND LIVE A HEALTHY AND PRODUCTIVE LIFE AFTER THIS MISERABLE EXPERENCE WITH THE "CANCER DANCE"!! ( CHIEF ADMINISTRATION OFFICER OF THE RADIOLOGY/ONCOLOGY DEPARTMENT). WE WERE CELEBRATING THE END OF MY RADIATION THERAPY A FEW DAYS AHEAD OF TIME. JENNIFER IS THE ONE WHO MADE IT POSSIBLE FOR ME TO DOCUMENT MY EXPERIENCE IN HER DEPARTMENT. SHE IS BY FAR ONE OF THE MOST GENEROUS , POSITIVE, FUNNY, HAPPY, AND GENUINE LADY I HAVE EVER MET. 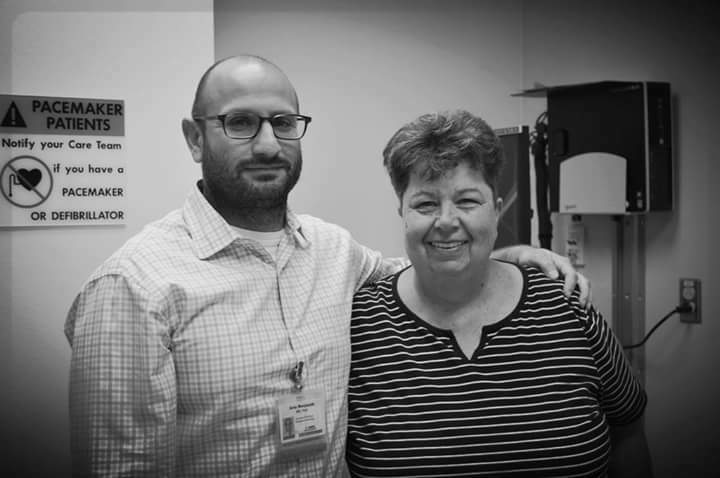 SHE NEVER MISSED A BEAT TO COME IN AND GIVE ME A HUG AND SAY "HI" TO ME DURING THE COURSE OF MY TREATMENT. SHE WENT THE EXTRA MILE AND THEN SOME TO ACCOMODATE ME IN MY QUEST TO DOCUMENT THIS JOURNEY. I WILL BE FOREVER GREATFUL FOR HER "GOODNESS AND HUMANITY"
MY WONDERFUL CARE TEAM!! I CANNOT SAY ENOUGH ABOUT THESE AMAZING "EARTHS ANGELS", THEY SMILE AT YOU AND COMFORT YOU ON YOUR WORST DAYS. THEY MAKE YOU FEEL LIKE YOU ARE GOING TO BE OKAY. THEY WILL FOREVER HOLD A SPECIAL PLACE AND SPECIAL BOND IN MY HEART!! On November first while doing my status check I relayed an episode to my doctor of having shortness of breath earlier that morning while taking a shower. I told Dr. Monjazeb I felt like I was going to faint so I dropped to the ground and basically craweled out of the shower and laid on the floor because I didn't want to hit the floor and pass out. He didn't like that at all and immediatley called transport and sent me over to the UCD ER right across the street. I was not happy about that, however , I knew it was a necessary evil. They did a chesk x-ray on me and a lot of blood work. They also did a CT Scan with contrast on my chest. The findings were not what I expected. They found a 2cm nodule on my thyroid, and two small nodules on my lung, and an enlarged pulmonary artery. So...... once radiation was completed, I had to follow through with my Dr. only to have to go through more tests. I just completed an Ultrasound on my thyroid and I'm waiting for the results. I'm starting to regain my energy back. The last two weeks of radiation took it's toll on me and was completely unexpected by me. I felt 'listless" no energy what-so-ever. I felt as if somebody would blow on me I would fall over because I felt so weak. Today, December 6, 2016, I had a follow up appointment with my regular doctor regarding multible lesions on my Thyroid. They called me and said they needed to do a biopsy on the largest one, which is 2.5 cm. I told them NO, because I'm scheduled for surgery next week, December 14, 2016 to have the tumor removed off my leg and I don'want any extra drama going on in the meantime. So they relayed the information to my surgiical team. I have an echo-cardiogram scheduled for this Thursday because of that enlarged pulmonary artery, and next Monday I have another MRI scheduled for my leg so they determine the size and debth of the tumor before the surgery. I'm very anxious to get this over with and get the tumor out. Thank You for taking the time to read my blog and feel free to input any additional information that you are aware of regarding cancer and it's treatments. I hope this brings valuable information and inspiration to anyone that has been diagnosed with cancer to understand there are things you can do on your own to facilitate your healing and refuse to give up on being well.